GamerDad: Gaming with Children » GameBoy Micro for 3? « Halo Reach – should it be T-Teen? MR. KIRBY ASKS: I have a 3 year old boy and he loves to play with handheld games. My cell phone for one. In your opinion, is the gameboy micro too advanced for a 3 year old? Are there games available for him to play and know how to play that doesn’t require reading? Thanks in advance to your response. 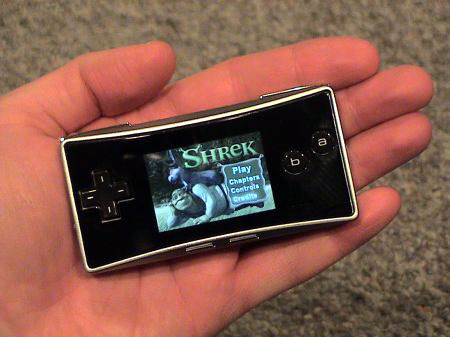 GAMERDAD SAYS: I love the Gameboy Micro, just love it. I’ve never actually used mine much – because I have so many other options – but I really dig the size and convenience. I don’t recommend it for you though. Don’t get me wrong, the size is okay with supervision and the GBA does offer a handful of kiddie games and platformers (like Super Mario) but the DS also offers this and will last you longer because of all the cool DS games out there (most of which also means reading – and you have to worry about the kid losing the stylus. So what would I do? I’d buy a Leapster 2. LOTS of educational games based on licensed properties (Spidey, Disney, etc.,) and the system and software are built rugged. Even for a 3-year old. Hi, I have a 11 year old daughter. I was wondering if gauntlet, Dark Legacy (For the gamecube) is ok for her. Thanks in advance! On topic: yes, for goodness’ sake, get something actually made for a 3 year old!! Gauntlet: Dark Legacy really *is* a descendant of the original Gauntlet. It’s a silly arcade-ey game where you wander through on-screen environments and fight or shoot monsters to get treasure and powerups. I’m sure GamerDad will have more to say on this, but action RPGs like Baldur’s Gate: Dark Alliance, Justice League Heroes, X-men Legends, Marvel: Ultimate Alliance, Champions of Norrath, etc. are really some of the best ways of spending time with basically anyone in your family. I would have loved any of these games at 11, and now that I’m grown up I have enjoyed playing through all of them with my dad and with my girlfriend. If I were you, I’d seriously consider getting Baldur’s Gate: Dark Alliance for the GameCube if you can find it ; it may not be quite as good as the PS2 version, and it might have some teen-ish elements, but it’s such a blast to play I can’t recommend it enough! It’s a two-player game, but the other games can be played with up to four players. They are really my favorite console games. Also, as much as I love the GameCube, you should also consider getting a Wii console (if you don’t have one already) as well for several reasons: first, it has lots of wonderful (and family-friendly) games from Nintendo – just read the reviews to see how great these games are; second, it has cool motion-based games (like Wii sports) which are a blast to play with the whole family; third, it still plays all of your GameCube games! Oh yeah, and 4th: it has Wii Fit, which may not help your fitness but really has some interesting balance-based games which are quite fun to play and improve your coordination. Henry -7- and I are about halfway through Marvel Ultimate Alliance 1 and I’m learning that my son likes the strong guys. I bought the extra character pack and he rotates through Thing, Hulk and Venom while I stick with Captain America, Thor and Wolverine. When I was four I played Zelda on my dad’s old game boy, and I got pretty far (up to the third dungeon) for my age at the time. It also taught me how to read, which is probably why my mom encouraged my to buy more. Who knew that a four-year-old could benefit from whacking things with swords?